The Town of Kinmundy had its start with the purchase by John BLURTON from the Illinois Central Railroad the north half of the southeast quarter of section 22, T4N, R3E, on the 1st of March 1857, which in turn was purchased by William SPROUSE, who platted the town on the 10th of April. The first purchaser of lots was Jerry BISSONET. And from this the town grew with leaps and bounds. In less than a decade the town had grown to the following: 8 Dry Goods and General Merchandise (L.C. BUDLONG, C. P. ROHRBOUGH, EAGAN & MUNGER, C. SPAFFORD, W. CULLY, SWEENY & DYSART, HALL & WILSON, POLLARD & JONES); 1 General Grocery and Provision Store (COLEMAN & JOHNSON); 3 Drug Stores (D. WHITE, HUMBEL, ELDER); 5 doctors (SKILLING, WEATHERFORD, HATTON, ELDER, HUMBLE); 2 Shoe and Shoe Repair Stores (KELLEY, RUSSELL); Jewelry and Jewelry Repair Store (F. H. GREEN); 2 Furniture Stores (F. RUSSELL, DUMOND); 3 Blacksmiths and Wagon Repair Shops (MOON & EAGEN, J. WOLF, N. MAXFIELD); 2 Harness and Saddle Shops (J. HAWORTH, R. WARSLAND); 2 Saw-mills (W. T. SPROUSE, W. R. BOOTH); Machine Shop for Agricultural Implements (B. CHALFANT); Land Agent for the I. C. R. R. (W.R. HUBBARD); Post Master (B. H. PIERSON); A Two-story school building (Professor Simeon WRIGHT, Miss ELDER, Miss WOODRUFF, Miss HITE); 3 Churches (Methodist-Episcopal, Rev. P. P. HAMILTON, Cumberland Presbyterian, Rev. SHARP; Southern Baptist, Rev. Isaac DALE). Kinmundy became quite a town in such a small amount of time. On the 10th of April, 1867, the Kinmundy City Council met to organize. The oath of office was administered by Tilman RASER, Justice of the Peace. The first officers of the Town of Kinmundy: W. R. HUBBARD, Mayor; U. M. HUMBLE, City Clerk; A. R. SWAN, City Marshall; Robert NEVINS, Street Commissioner; Alderman for 1st ward--Clinton WOLF and I. C. HAWORTH; Alderman for 2nd ward--T. O. HATTON and Tilman RASER; 3rd ward--I. S. SWENEY and C. H. MUNGER; 4th ward--W. B. EAGEN and W. T. SPROUSE. 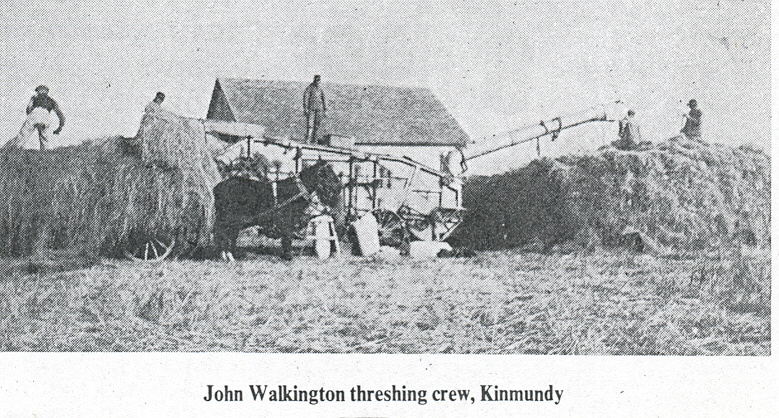 By 1868 Kinmundy had a population of over 1,200 people. In 1871, Kinmundy bought Shelton's Grove for a city park. In 1870, the first bank in Kinmundy was organized by W. T. HAYMOND & Company. When Mr. HAYMOND died in 1899, the National Bank was organized, which is a bank to this day in Kinmundy. There was also a private bank called The Warren Bank, which later changed its name to Farmer's & Merchant's Bank. On 2 Dec 1903, Kinmundy was struck by a terrible fire, during the evening. Much of the downtown was destroyed. The following businesses were destroyed: S. G. WEISBER (dry goods and clothing); S. L. BUNDY (clothing and shoes); W. H. GRAY; WITWER Block; Masonic Temple; Express-Journal; S.R. 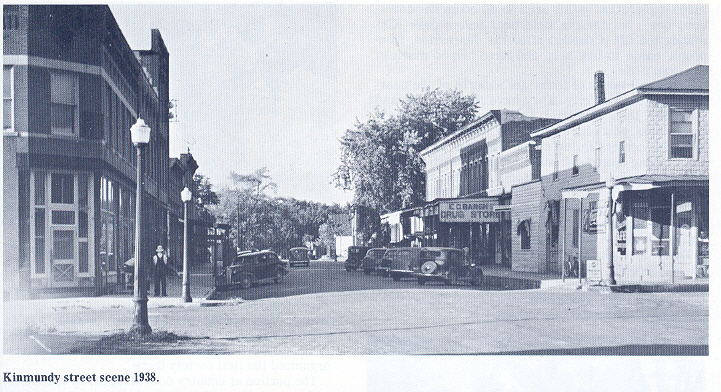 WOOLLEY (real estate); GUNN & KILLIE (groceries); C. W. WITWER (real estate); City Council Chamber; M. A. SONGER (dry goods); First National Bank, G. W. ELDER Block; HOLT & HUGGINS (attorney’s); John W. HALL (real estate); J. M. ROTAN & Son (real estate); I. O. O. F. Hall; C. T. MIDDLETON (grocery & notions); J. P. WHITSON (harness); GRAMLEY Brothers (grocery & meat market); HAWORTH's Opera House; Dr. J. D. CAMERER; J. F. REEDER: and some others. 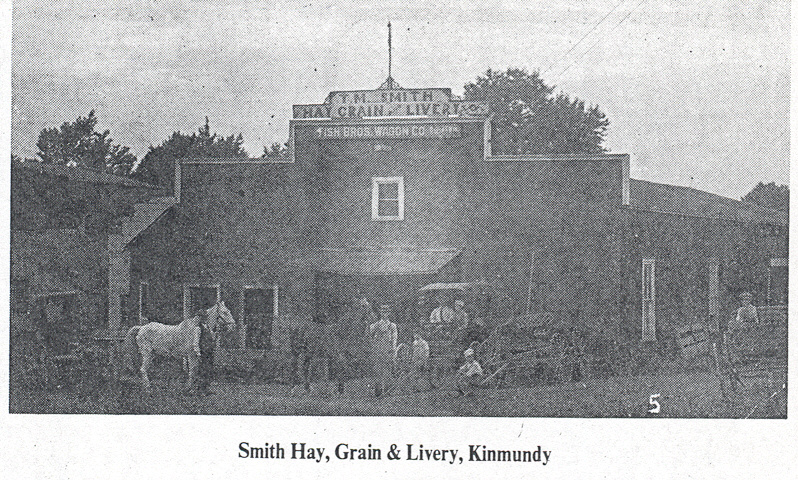 By 1908, Kinmundy had picked itself up and was once again a thriving city. It had a population of 1,500. The following businesses were listed in the 1908 "Dunn & Bradstreet": ALLEN & KAY Hotel; Edwin C. BARGH (Drugs, Books & Stationary); Charles BUSSWELL (Restaurant); E. X. COMBS & Son (Lumber & Hardware); B. D. CRAIG (Agricultural Implements); Louis R. DAVIS (Dry Goods, Shoes and Groceries); Mrs. Allie DENNIS (Millinery); Gustin L. EAGAN (Blacksmith); Charles L. FOSTER (Photographer); Mrs. C. H. GORDON (Dry Goods and Groceries); M. P. GRAMLEY (Grocery and Meat); GRAY & MALONE (Meat); F. O. GRISSOM (Publisher); J. W. HAWORTH (Harness); Ufa HOUSH (Grocery); J. H. JACKSON (Grocery); F. W. KILLIE (Grocery); Kinmundy Milling Company; Kinmundy Mutual Telephone Company; W. W. LOWE (Grocery Store); L. C. MATTHEWS (Hay); L. C. MATTHEWS (Grocery Store); E. G. MENDENHALL (Fruit Growers Supply); MINER Brothers (Hay, Grain and Implements); John MOTCH (Painter); Wm. W. NEIL (Furniture and Undertaker); John N. NELMS (Furniture and Undertaker); F. E. NELMS & Company (G. S.); Jacob NELSON (Jewelry); George W. NEWELL (D. G., Notions and Grocery); Fred J. NIRIDER (Drugs and Stationary); PHILLIPS Brothers (Hardware and Stoves); F. A. PRUETT & Sons (Produce and Poultry); N. A. RICE (Grocery Store); C. B. ROHRBOUGH (Clothing, Shoes and Men's); F. M. SMITH (Livery); E. A. SNELLING (Restaurant & Confectionary); Miss M. A. SONGER (Millinery and Dry Goods); W. H. STORRS (Telephone); George P. TOMLINSON (Hardware and Stoves); WARREN Banking Company; J. P. WHITSON (Harness); E. D. WILLIAMS (Hotel); Mrs. M. WILLIAMS (News and Notions); Margaret A WILLIAMS (News & c); WILLIAMS & LACEY (Confectionery and Restaurant); T. WINN (Bakery); Ellis WOLFE (Stoves and Plumbing); B. T. WOOTON (Bakery); ZIMMER & McWILLIAM (Blacksmith ). In 1916, the Opera House, which had been rebuilt after the fire of 1903, burned once again. This time it was not rebuilt. On 13 Mar 1867, the first newspaper was published in Kinmundy, “The Kinmundy Telegram,” by Colonel J. W. FULLER, who sold it to H. H. CHESLEY, who in turn sold it to O'BRYANT & PYLES in 1868. Later O'BRYANT bought out PYLES’ share of the paper. The name was changed to “The Kinmundy Democrat,” and later changed again to “The Kinmundy Independent.” O'BRYANT sold the paper to Edward FREEMAN in 1871, which he published for ten years, until his death. “The Kinmundy Bulletin” had its first publishing 1 Jan 1875, by PYLES. “The Kinmundy Register” began in 1879, by W. L. ARNOLD. “The Reform Leader” was moved from Sandoval by G. W. RUTHERFORD. “The Kinmundy Express” began 8 Nov 1883 by R. F. LAWSON. It was bought by F. O. GRISSOM of Farina in 1898, followed by purchasers Gus SPITZE, Lem BALLANCE, and Norris VALLOW. In 1903 F. O. GRISSOM combined the Journal, which he had bought in Patoka, with the Express. The Kinmundy Express is still published today as a weekly newspaper, publishers Rudy and Judi SLANE. Kinmundy has a very interesting and unique tourist attraction. It is Ingram's Log Cabin Village. It is made up of 17 authentic log buildings dating from 1818 to 1860. 13 of the log cabins are also authentically furnished. The cabins were all numbered taken down and rebuilt on the north edge of Kinmundy on 65 acres. This task was begun by Mrs. Erma INGRAM, a retired school teacher. The labor was done by her son and hired men from Kinmundy. A Craft Fair is held there the last two weekends in September and the second weekend in October. It is Quite enjoyable. In 1857, Kinmundy built a frame school building that was 36 feet by 24 feet. In 1865 a new four-room, two-story frame school was built and at a later date had an addition built onto it. In 1910, the frame building was torn down and a new brick two-story building was built in the same location. When I attended high school in Kinmundy in 1972 and 1973, this was the Kinmundy-Alma High School, as well as the junior high. In 1924, a gymnasium was built on the north end of the school campus. In 1953 the Kinmundy-Alma Consolidated District was formed, which lasted until 1989 when it became the South Central Community School District. In 1956, a new gymnasium was built on the southeast edge of the campus. The old gym was hit by a tornado in 1972 and had to be torn down. Up until that time the old gym was used for different things, including the carnival. A new school was built in 1978 just west of the then high school. The two-story brick school was then torn down. This was used as the Kinmundy-Alma High School. The Junior High was located in Alma. The Elementary School is on the Kinmundy-Louisville Road on the east edge of Kinmundy, which was built in 1955. The Kinmundy-Alma High School is now the South Central Junior High School. In 1989, the Kinmundy-Alma School District merged with the Farina-LaGrove School District and became the South Central Community School District. The elementary and junior high schools are in Kinmundy and the high school is in Farina. On 21 Mar 1991, two more buildings of down town Kinmundy were torn down. The buildings once housed Bud MOTCH and Beak MAHAN's Grocery store and the Virgil McKITRICK Manufacturing, which made and distributed rat poison. Both buildings were later purchased by Keith SCHWABE and housed his hardware store until the mid 1970's, when the CHRISTOFFEL family purchased it. In the late 1980's the buildings were purchased by Roy BOWEN, who had them torn down. From the very beginning of its existence, Kinmundy has had well maintained church edifices. The churches of 1991 are as follows: Kinmundy Christian Church, Mike COURSON Minister and James MULVANEY, Sunday School Superintendent--founded in 1900; St. Elizabeth-Seton Catholic Church, Father Andrew J. KNOPIK--located on North Madison; Kinmundy United Pentecostal Church, Warner DAVIS, Pastor--located on 3rd Street; Kinmundy United Methodist Church, Stephen PALMER, Pastor--Susan SMITH, Sunday School Superintendent--founded in 1863--located on 3rd & Washington--It is the oldest organized church in Kinmundy today; First Baptist Church, Pastors Jim & Ray BARNES--located at 310 N. Monroe. Kinmundy has several beautiful old homes. One of them is the pre-Civil War Mansion known for many years as Leach's Mansion, home of Orous LEACH and his family. The brick home was built in 1857 with 18 inch thick walls and has 12-foot high ceilings. It has eight large rooms with a fireplace in everyone. It has two staircases, but originally had three. It was built by Michael WOLFE from Louisville, Kentucky. The name of the estate was Fleetwood. It was later bought by George WEST in 1868 and he in turn sold it to his son, Charles WEST, who named the estate Hereford Park. From him the owners were: Henry GREENING, William H. MEEKS, Airs CONANT, John MERCHANT, Tony YOUNG, Orous LEACH, and now has been sold to a man from Arizona. The home was used as an underground railway for escaped slaves from the south on their way to Canada. The businesses of Kinmundy in 1991 were as follows: The IGA (grocery store); Judy's Restaurant; The first National Bank; Nancy's Hair Styles; Jeri's Hairstyling; Kinmundy Kinder Kare; Carolyn's Flowers & Gifts; Kinmundy Tax Service; Ken's Barber Shop; Madison Street Real Estate; Queen Anne's Lace Crafts; Robert Halls Auto Repair; The Hair Shoppe/Power Fingers Music Studio; Ritter Car Wash; Rich's Auction Service; Don's Meat Processing & Groceries; Day Oil Company; Vig Fertilizer Company; Curve Video (formerly the Curve Drive In Restaurant); Montes Used Cars; Chasteen Auto Body; Dave White's Auto Sales; Kinmundy Insurance; Kinmundy Slaughter; Neal-Linton Funeral Home; Shelter Insurance; Terry Lee Refrigeration; Johnson's Amoco; Sunoco Gas Station; White’s Union 76 Gas Station; Kinmundy also has: Post Office; City Hall; Community Center; Park; Water Plant; Kinmundy-Alma Fire Department; Kinmundy-Alma Sportsman's Club--Lake; Drs. Agliar & Rubio's Clinic; The Lions Field Ball Diamond. The Kinmundy of 1991 is quite different from the Kinmundy of 1908. Many of the old buildings down town have been torn down. I was born on the 100th anniversary of the Town of Kinmundy. And even in my 34 years, I have seen a great change in the town. There were several different gas stations, grocery stores and cafes, etc. Kinmundy may not be the size of town it once was, but it has a proud people who care about it and strive to keep it a beautiful peaceful place to live for themselves and generations to come. We have pics, family histories, etc. We have lots of pics, family histories, etc. Additions and/or corrections are most welcome. Photos of homes, barns, families, scenes, etc.